I get to start off the gallery! I received my wonderful package from Spidersweb today. She made some beautiful pieces. My ancient culture was the Celts. Now for the gorgeous large piece. I'm a follower of Arianrhod, so she made me a moon-themed wall hanging! I'm jealous of anyone who can do needlework since it's one of the few crafts that I can't. Ready for awesomeness? Thanks for being an amazing partner, Spidersweb!!! That is some very beautiful stuff! I love the wall hanging, it's so very well done. Nice stitching too! Oh, that wall hanging is awesome. Great start for the gallery! I'm so glad you enjoyed your package! I have been out of town (still am - ), but I am looking forward to seeing everything that people have made when I get back! The wall hanging is beautiful, those details! I was BLOWN AWAY by what was inside! I'm sorry that's a bit blurry-- my kitty was ALL about the wrapping paper and box, and was in the way. 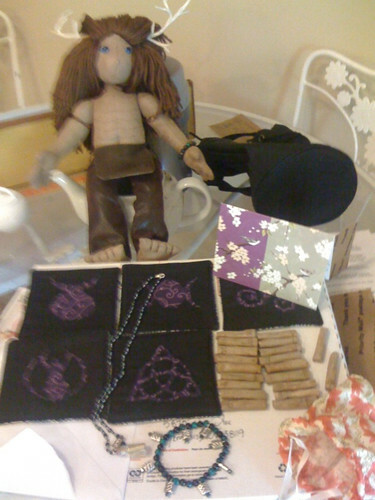 From top left: a poppet of Cernunnos, the card on top of celtic/prehistoric symbol coasters, ogham rune 'stones' and a pretty bag, a bracelet, and a necklace. I am spoiled! Do you see the poppet, do you?!?!?! This is the first poppet I have ever gotten and holy frijoles! 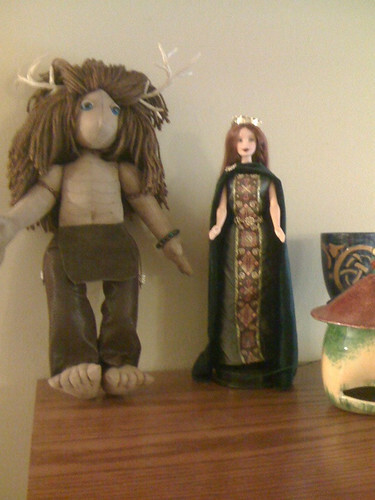 After I had played with him for a bit (and tried to decide if it's weird if I think he's rather MRAWR for a poppet), I put him on display with the SCA er, Princess of Ireland Barbie that a friend gave me a few years back. I think he likes it there. 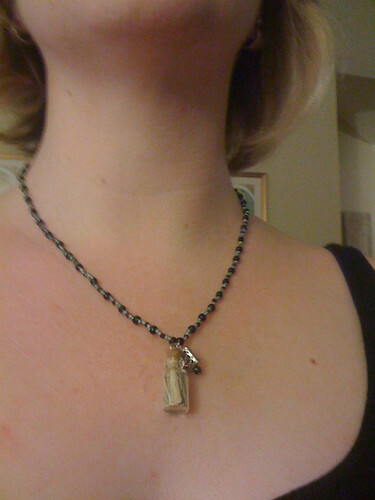 Then I put my necklace on. Thank you-- it is the perfect length, which is always difficult for me to find. (I have a big neck and the standard necklace size is too small.) I wore it around for all my errand-running today! Awesome! Love the Cernunnos! And isn't that SCA :::cough::: Princess of Ireland Barbie a lucky gal?